Assata Zerai explains the double displacement of scholarship by African women. In audaciously calling for a transformation in social sciences epistemology, she argues for rectification of transnational and gendered digital inequalities that marginalizes women in the Africa. The voices and contributions of African women scholars are regularly excluded from several fields of study. Indeed, I demonstrate evidence of a double displacement: not only is African scholarship often excluded from western databases, the intellectual circles of the African continent often overlook the work of African women, especially those whose research is feminist or women-centered. Whereas western scholarship has often worked to disempower marginalized populations and has been an integral part of colonizing strategies, I seek to decolonize research by initiating a sea-change in the way that western scholars conduct research in and on African nations. 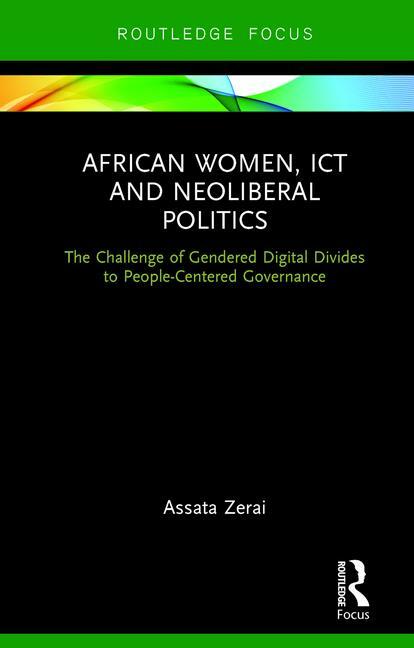 My book, African Women, ICT and Neoliberal Politics: The Challenge of Gendered Digital Divides to People-Centered Governance (Routledge 2018), demonstrates the critical importance of engaging African women’s intellectual work, in order to counter the androcentricism of current scholarly literatures across key fields of study and to further offset the hegemony of North Atlantic social scientists, engineers, and development specialists who consistently fail to engage African scholars’ work or to consult with stakeholders in African communities. In my book, I critically assess Simplice Asongu and Jacinta Nwachukwu’s argument that access to information and communications technology (ICT) – cell phones, personal computers, and the internet – is linked to the development of more democratic governance structures in African countries. As a social demographer writing from an African feminist perspective, I challenge Asongu and Nwachukwu’s androcentric line of inquiry, which defines “good governance” utilizing World Bank driven conceptualizations. I argue that their definition of good governance excludes the concerns of African women and the realities of their lives. Furthermore, I challenge their theoretical model that does not account for the impact of women’s access to ICT. In this new book, I provide evidence that women’s access to ICT makes a difference to the success of people-centered governance structures, and I further demonstrate how African women’s scholarship, too often marginalized, must be used to expand and redefine the goals and indicators of democratic governance in African countries. Further, I elaborate on how to address the bias of bibliographic databases that drastically underrepresent the scholarship of women from African countries as well as from many other regions of the Global South. This digital inequality is both intellectually and ethically dangerous, leading to what Reiland Rabaka describe as the “conceptual quarantining of knowledge, (and especially) anti-imperial thought, and/or radical political praxis.” Internet research, proprietary online databases, and other digital resources have contributed to this phenomenon, because western producers of knowledge about Africa – and those creating policies for Africa –are cut off from the perspectives, epistemologies, findings, and values of African researchers. Western scholars and policy makers tend to focus on the scholarship captured by databases that exclude both emerging and experienced scholars from the African continent, especially women. The lack of inclusion is especially detrimental to researchers whose primary appointments are at African universities. Working in concert with noted scholars and stakeholders in several African countries, I argue for a Database of African Women’s Scholarship, expanding on an initiative I began several years ago. I envision this as a tool to promote cultural change within North Atlantic and African scholarly circles, by raising awareness of local scholarship and promoting the knowledge of local experts. I argue for a future in which field research is carried out by western scholars only in consultation and collaboration with local specialists, and in which the research of African scholars – especially women – is taken fully into account by their peers across the globe. This epistemological transformation will create better partnerships and pave the way for the co-creation of more adaptable and acceptable technologies, as well as other much-needed interventions and innovations. In African Women, ICT and Neoliberal Politics, I seek to “disrupt the conventional division of labor in the social sciences, in which African scholars provide empirical evidence while the heavy lifting of theorizing are left to their western counterparts,” as Michael West (2016) has characterized the problem. Answering UNESCO’s call to work in dialogue with intellectuals and practitioners in the Southern hemisphere is a crucial intervention if we want to stem the process of critical decay within the social sciences and other fields, and to surmount the very grave intellectual and practical problems that have resulted from their lack of intellectual diversity. For many of us, global imperatives such as equity, sustainability, and human rights inspire our academic pursuits. Moving beyond our limited understandings so that we can better address such questions requires a free flow of ideas that eschews the marginalization of women in the Global South. This cannot happen if we do not rectify transnational and gendered digital inequalities. My work addresses these concerns by audaciously calling for a transformation in social sciences epistemology. It is my hope that African Women, ICT and Neoliberal Politics will amplify the voices of women scholars in Malawi, Tanzania and Zimbabwe and will demonstrate how their perspectives and findings are indispensable to scholars working in the multiple disciplines such as development effectiveness, gender and women’s studies, and social studies of science and technology. It will also serve as a model for databases that could transform research in many other fields, and in many other parts of the world. Assata Zerai is the Associate Provost for Faculty Excellence and Professor of Sociology at the University of Illinois.